Air Force had a late goal-line stand, Tyler Weaver returned a blocked punt 11 yards for a first-half touchdown and the Falcons beat No. 20 Boise State 27-20 on Friday in Air Force Academy, Colorado, ending the Broncos’ bid for the Mountain West title. Wyoming will face San Diego State in the conference championship game Dec. 3. Haji Dunn Jr. recovered quarterback Brett Rypien’s fumble on fourth-and-goal from the 1 with just less than 2 minutes remaining to help the Falcons (9-3, 5-3 Mountain West) knock off Boise State for a third straight season. They join Idaho (1982-93) and Nevada (1996-98) as the only teams to beat the Broncos in at least three straight years. The Broncos (10-2, 6-2, No. 19 CFP) needed a win at Air Force and for New Mexico to upset Mountain Division-leading Wyoming on Saturday to earn a spot in the conference’s title game. No reason to watch now. McNichols rushed for 60 yards – and a score – on his opening two carries, but was held to 28 yards the rest of the way. He had three carries at the goal line on Boise State’s last possession, but couldn’t get in. On fourth down, Rypien tried to sneak it in only to have the ball knocked free by Hicks. Dunn was there to recover it. Off target most of the day, Rypien found his touch in the fourth quarter and led a spirited Broncos rally. 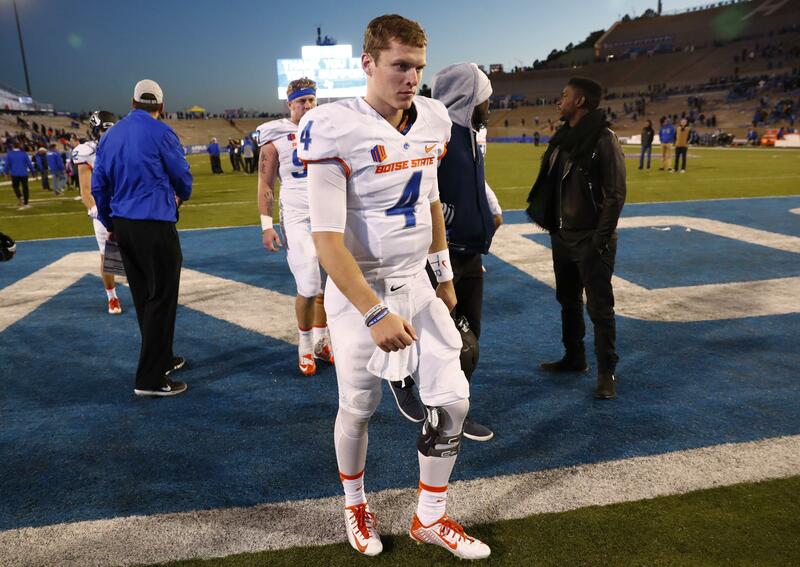 He hit Wilson for a 75-yard TD pass to pull Boise State to 27-20 with 8:50 remaining. He wound up a yard shy of possibly tying the game. Air Force took advantage of a Boise State defense that was missing several starters by running it up the middle. Falcon fullbacks D.J. Johnson and Shayne Davern combined for 25 carries and 111 yards up the middle. Johnson scored on a 1-yard plunge in the first quarter and Davern on an 8-yard run in the third. (14) Western Michigan 55, Toledo 35: Corey Davis became the career FBS leader in yards receiving and the Broncos (12-0, 8-0) wrapped up an undefeated regular season in style, routing the Rockets (9-3, 6-2) in Kalamazoo, Michigan, to secure a berth in next week’s Mid-American Conference championship game. Iowa 40, (17) Nebraska 10: C.J. Beathard threw three touchdown passes and the Hawkeyes (8-4, 6-3) pummeled the Cornhuskers (9-3, 6-3) in Iowa City, Iowa, knocking Nebraska out of Big Ten title contention and sending Wisconsin to the championship game. Memphis 48, (18) Houston 44: In what might be sought-after coach Tom Herman’s final game with the Cougars (9-3, 5-3 American Athletic Conference), Riley Ferguson threw a 10-yard touchdown pass with 19 seconds left in a wild fourth quarter to lift the Tigers (8-4, 5-3) to a win in Memphis, Tennessee. Published: Nov. 25, 2016, 4:26 p.m.